New research from Yale University suggests that the unusual melting behavior of the second most abundant mineral in the Earth may affect key processes deep within the Earth. Research by geoscientists at Yale suggests that convection in Earth’s mantle — the slow movement of rocks circulating beneath the surface, caused by heat from inside the Earth — is affected by how ferropericlase melts at high pressures. The findings appear online December 8 in the journal Nature Communications. “The melting temperature of most materials increases as one increases pressure, and for ferropericlase this is true except at depths between ~1000 and 1500 km,” said Kanani Lee, the study’s principal investigator and an associate professor of geology and geophysics at Yale. 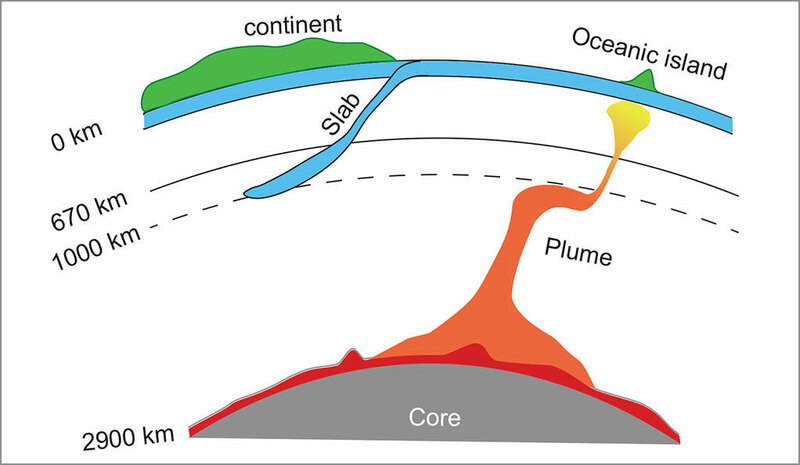 Plate tectonics drive oceanic slabs deep into the mantle, generating large earthquakes at relatively shallow depths. The slabs continue to sink, but some of them flounder at ~ 1000 km, such as the slabs under Tonga, the Philippines, and Japan. Additionally, hot rock rising from near the core-mantle boundary forms conduits, called plumes, that feed some volcanism at the surface. Hawaii and Iceland are such hotspots whose plumes are deflected at ~ 1000 km depth, which may affect the surface expression of volcanism in those locations. Be the first to comment on "Unusual Melting May Affect Key Processes Deep Within the Earth"